The BOOGABILLA in Tilbury showing Scan Carriers markings. The roll-on/roll-off and containership BOOGABILLA was built in 1978 and was originally of 39,355 tons gross. Up to 2004 it was under the Norwegian flag and owned by Wilhelmsen of Oslo, but had a name change in 1989 to TAPIOLA. In 2004, it was converted to a ro-ro vehicles carrier, with a capacity of over 3000 standard size cars and it was increased to 54,680 tons gross. 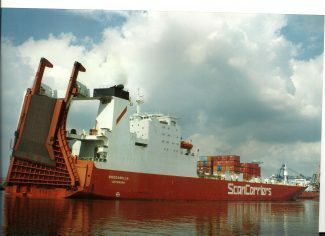 It was then transferred to the Singapore flag, but under Wilhelmsen control, with its Indian subsidiary management company handling its day-to-day operation. The vessel was broken up in China in 2010.